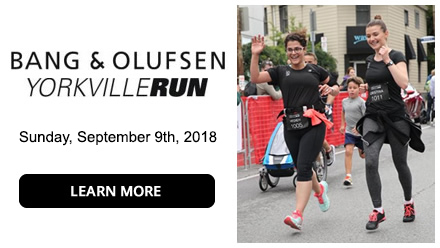 PAWS Volunteers were invited to participate in the B&O Yorkville Run in 2017 and we proudly raised over $20,000 for the animals!!! We are thrilled to be included again this year in this amazing event. We have 85 dedicated animal lovers running for PAWS in 2018!!! PAWS President, Kimberly Heys, has a personal goal of raising a minimum of $5,000 for the animals this time around ... PLEASE CONSIDER SPONSORING HER 5K RUN TODAY. The People's Institute for No Kill is super charged and so very honoured to present the Canadian debut screening of Nathan's film "Redemption", the No Kill revolution that is sweeping North America. I am hoping to see EVERYONE who supports PAWS and our life saving work at the El Macambo next Saturday night! It is sure to be an awesome evening... a great chance for all of us to re-group and to support LITTLE CREATURES and their friends who will be fundraising for PAWS on this special evening! 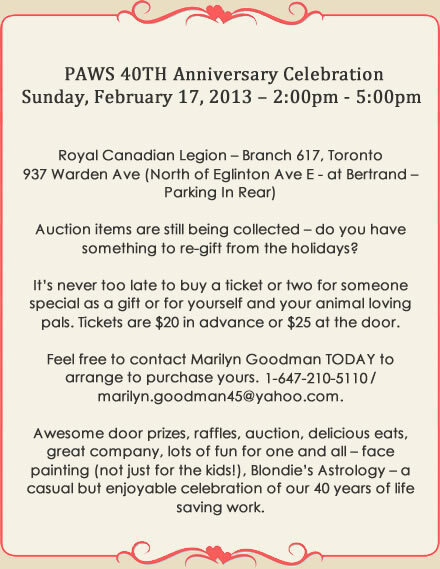 PAWS Volunteers and I are looking so forward to this night and we would like to offer special thanks to our new friends Alison and Chris of Little Creatures and to The Madison Manor Boutique Hotel for providing accommodations so that I may stay in Toronto that evening and to Annette and Kayla who will make it possible for me to be away from the shelter. SEE YOU NEXT SATURDAY!? Please read the following to learn more and be sure to share this with all of your animal loving friends, family and co-workers – OUR GOAL IS TO SELL OUT THIS VENUE – please help us to make this happen! (I’ve heard a rumor that there is a chance to win $500!). Have you ever considered holding an event of your own to raise much-needed funds for PAWS? Lindsay Lights - Special thanks to The Lindsay Family of Richmond Hill who so generously contributed a portion of the donations from their spectacular annual Holiday Light Show again in 2007. Be sure to visit their website at www.lindsaylights.com for complete information on this unique experience. The Lindsay Family raised $4,500 for PAWS! Softchoice - At their annual Holiday Party, Softchoice raises money for local charities. We are very grateful that PAWS was their “charity of choice” in 2007. Thanks Softchoice! www.softchoice.com Softchoice raised $4,525 for PAWS! Justin - this selfless young man who turned 13 recently, decided that, rather than enjoy Birthday gifts that he may not need or use, he would request donations to help homeless animals. You guessed it - PAWS was the chosen recipient. Thank you Justin (and his Mom, Julie) for your support. PAWS Volunteers are thrilled that people of all ages are becoming more and more involved in their communities by Volunteering and supporting causes that are close to their hearts. Justin raised $500 for PAWS! Smile - Philanthropy is contagious!